Wolfsburg, 31 July 2008 - The Volkswagen Showcase on the "Olympic Green" is now ready to welcome guests to the 2008 Olympic Games in Beijing. As the exclusive Automobile Partner of the Beijing Organizing Committee of the 2008 Olympic Games (BOCOG) and national sponsor, Volkswagen Group China has already handed over 5,000 vehicles, all complying with the Euro IV emissions standard, as logistic support for athletes, the media and Olympic guests. Furthermore, Volkswagen is providing a fleet of very low-emission, low-consumption vehicles christened the "Green Fleet" to the BOCOG's Main Press Center. Complementing the vehicle fleet, the Volkswagen Showcase is the second main pillar of Volkswagen's Olympic commitment. "The pavilion gives our guests to the Olympic Games the opportunity to experience the Volkswagen Group and its brands in the unique environment of the world's biggest sporting event," Lutz Kothe, Head of Sponsoring & Events at Volkswagen AG, commented. The company expects to welcome four million guests, or around 160,000 visitors per day, to the Volkswagen pavilion at the Olympic Games. The design of the pavilion features three interlinked themes: the automobile, the Olympic Games and the host country China. The exhibition center and meeting place is housed in a two-storey building which also contains service rooms and two lounges. Under the Volkswagen Group's motto of "Driving Ideas," the future vision of sustainable mobility is presented in a transparent showcase. A fuel pump nozzle made of straw symbolizes the Group's strategy to support second-generation "Sunfuel" biofuels. A second, real-life, nozzle represents present-day fossil fuel supplies. The yin and yang symbols reflect the host country's traditional culture as well as symbolizing a solution combining both technologies. The Group showcase is surrounded by six transparent brand boxes, presenting two vehicles from each of the Volkswagen, Audi and Skoda brands. "Each of the models on show is combined with an Olympic sport associated with the respective brand. The Skoda brand, for example, teams up with cycling," says Kothe, explaining the showcase concept. The aerodynamic form of the Audi R8 TDI Le Mans connects with swimming. For Volkswagen, the chosen sport is soccer. The six brand showcases also present different time worlds. Each model stands for a particular phase in the brand's history. The Volkswagen Passat CC represents the present, while the Space up! Blue symbolizes tomorrow's mobility. Audi and Skoda celebrate their wonderful brand history with the Monte Carlo old-timer and the Auto Union racing car, while the Octavia represents Skoda's present model range and the Audi R8 TDI Le Mans embodies the trendsetter of tomorrow. The pavilion also features a 70-meter long, 3-meter tall high-tech media banner with nine mobile LED panels bringing guests the "Olympic Loop" designed by Volkswagen. Seven different thematic sections make the connection between China, the Olympics and the Volkswagen Group and its brands. A newscrawler brings visitors the latest competition results. The banner also serves as the moving background to a live performance by high-wire acrobats taking place up to ten times each day. 190 exhibition stand builders used approximately 500 metric tons of steel and around 1,600 m3 of concrete to build an area measuring approximately 2,700 m2, 2,000 m2 of which is taken up by the pavilion alone. Some of the materials were produced locally in China. Some 890 packages weighing 256 metric tons each were shipped by air and sea to China from Germany. "We are very proud of the Volkswagen Olympia Showcase, which will be our home base over the next few weeks. Together with our guests and the athletes, we are looking forward to the 2008 Olympic Games in Beijing," Kothe added. CHERRY HILL, NJ - Subaru is revving up performance and handling in its iconic All-Wheel Drive Impreza WRX sport compact for 2009, following the debut of the all-new model in 2008. Performance leaps to a higher level in the 2009 WRX thanks to a 265 horsepower turbocharged intercooled Boxer engine, retuned suspension and wider, lower-profile summer performance tires. WRX enthusiasts will quickly identify the 2009 models by the ST-type grille and standard Aero Package. The 2009 Impreza WRX comes with a 5-speed manual transmission. Subaru is also introducing a new Impreza 2.5GT model for 2009, powered by a 224-horsepower turbocharged intercooled engine teamed to a standard 4-speed electronically controlled automatic transmission with SPORTSHIFT. The goal of the 2009 WRX team was termed "Kyo-Ka" (translated from Japanese as "strengthening"). To achieve this goal Subaru engineers thoroughly revamped the performance character of the WRX for 2009. Gaining a larger turbocharger, along with a new larger-diameter exhaust and low-density catalyst for reduced backpressure, the WRX engine now produces 265 horsepower at 6,000 rpm and 244 lb.-ft. of peak torque at 4,000 rpm – significant increases from the 224 horsepower and 226 lb.-ft. in the 2008 version. The Impreza WRX debuted an all-new platform for the 2008 model year, featuring a longer 103.1-inch wheelbase and an all-new double-wishbone rear suspension system. Revised suspension tuning for 2009 further bolsters WRX's street performance credentials. The standard 17 x 7-inch aluminum alloy wheels now wear 225/45R17 summer performance tires, compared to 205/50R17 all-season tires used on the 2008 WRX. The Vehicle Dynamics Control (VDC) stability and traction control system, which is standard on all Impreza models for 2009, helps to enhance the WRX model's road handling safety. Standard Symmetrical All-Wheel Drive, which forms the common core technology on all Subaru models, gives the Impreza WRX a significant handling performance advantage over front-wheel drive competitors. Symmetrical All-Wheel Drive is a complete system comprised of the Boxer engine and the full-time power distribution system (varies by model and transmission). The aluminum Boxer engine and simple, symmetrical drivetrain layout help to lower the car's center of gravity, which in turn contributes to its handling characteristics. The 2009 Impreza WRX employs a viscous coupling locking center differential that distributes torque 50:50 front/rear. Should slippage occur, this system transfers more power to the wheels with the best traction. The 2009 Impreza 2.5GT, like other Subaru models equipped with automatic transmission, uses a different version of the Symmetrical All-Wheel Drive system. An electronically managed continuously variable transfer clutch actively manages power distribution based on acceleration, deceleration, and available traction. This active torque-split system automatically transfers more power to the wheels with the best grip should slippage occur. Subaru significantly re-tuned the suspension on the 2009 WRX, resulting in sharper turn-in and more responsive handling overall. Front upper strut mounts are adopted from the STI. The front spring rate is increased from 26.5 N/mm to 38 N/mm, and the rear spring rate is increased from 24 N/mm to 34 N/mm. Diameter of the stabilizer bars is also increased, from 20 mm to 21 mm in front and from 15 mm to 16 mm in the rear. Suspension damping has also been re-tuned. Notably, the new, stiffer suspension tuning did not require any further reinforcement of the inherently strong Impreza body structure. Because the wider tires used on the 2009 WRX give more kickback than those on the 2008 model, a new damper valve was added to the steering gearbox to ensure a smooth and high quality steering feeling. The Impreza WRX chassis is designed for improved rigidity and ride comfort and employs high-tension steel at key structural points. In addition to providing a basis for more responsive handling, the double-wishbone rear suspension that debuted in the new-generation Impreza models enables a smooth ride quality as well as decreased road noise for a quieter cabin. The new-generation design results in a lower overall weight for the body while the longer wheelbase allows for improved ride dynamics, more interior room and reduced levels of noise, vibration, and harshness (NVH). In addition, the new chassis improves crash-worthiness and provides a stiffer platform for crisper handling. On both 2009 WRX Sedan and 5-Door models, a new STI-type grille carries the WRX badge. Both models get a sharpened new look from the standard Aero Package, which was formerly part of the optional WRX Premium Package. Both body styles also feature front and rear under-bumper spoilers and aerodynamic side ground effects. The sedan has a low-profile rear trunk spoiler, while the 5-Door adopts the WRX STI rear spoiler and a rear diffuser. The rear garnish panel between the light clusters is body color on the 5-Door and chrome on the sedan. The WRX interior introduced new comfort and spaciousness for 2008, and for 2009 it gains new WRX-exclusive carbon black checkered upholstery accented by red stitching. The standard tilt and telescoping leather-wrapped steering wheel is accented by red stitching and standard aluminum-alloy pedal covers now include the driver's footrest. Performance-design front seats integrate the backrest and head restraint into a single structure. The sporty instrument panel features electroluminescent gauges, similar to the WRX STI. As in the WRX STI, the indicator needles sweep the gauge faces upon engine startup for a sporty effect. The WRX Premium Package gains a power moonroof; other contents carry over, including the 10-speaker audio upgrade with auxiliary input jack, projector-beam fog lights, dual-mode heated front seats, heated exterior mirrors and a windshield wiper de-icer. The compact layout of the double-wishbone configuration helps to minimize intrusion into the cargo area, providing a wider and deeper luggage compartment. On the 5-Door WRX, the wide and flat load floor can accommodate two Tour-size golf bags with the rear seat backs in the upright position. In the WRX sedan, which is 4.5-inches longer than the previous-generation Impreza sedan and 6.5-inches longer than the new 5-Door models, the extra space provides for a larger, deeper trunk that can accommodate three Tour-size golf bags. In all WRX models, a 60/40-split folding rear seat further boosts cargo capacity and convenience. The available navigation and information center in Impreza WRX is the focal point of the center console. The navigation screen is located at the top of the dashboard for improved visibility and ease of use. With the navigation system, the center console provides an input for MP3 players as well as RCA-type video jacks that can accommodate portable gaming devices. These can be displayed on the navigation screen when the vehicle is parked. Impreza models come pre-wired for XM® or SIRIUS® Satellite Radio. Both the standard and optional Impreza audio systems feature the Radio Broadcast Data System (RBDS) that can display a variety of information, including a song's title and artist. The standard WRX audio system features an AM/FM stereo with single-disc CD player and four speakers. The WRX Premium Package adds an AM/FM stereo with 6-disc in-dash CD changer featuring MP3/WMA file capability. Occupants enjoy powerful sound from 10 upgraded speakers (six in the front doors, four in the rear doors) and SRS® Circle Surround Sound. Also with this package, the steering wheel adds audio system switches. An auxiliary audio input jack enables connection of an iPod or MP3 player. The new-generation Impreza models are built upon the proven Subaru Ring-Shaped Reinforcement Frame body structure with front and rear crumple zones. All Impreza models for 2009 feature a 4-wheel disc Anti-lock Brake System (ABS) with Electronic Brake-force Distribution (EBD) and Brake Assist. (The WRX and 2.5GT models have larger front brakes than other Impreza models.) All seats provide 3-point seatbelts (height-adjustable for outboard positions), and the front seatbelts have electrically triggered pre-tensioners and force limiters. Side-curtain airbags are standard on all 2009 Impreza models. The Subaru Advanced Frontal Airbag System (SRS) features front seat side impact airbags and a driver's side front airbag that deploys according to the driver's proximity to the steering wheel, as measured by a sensor on the seat track. In the passenger side front seat, a sensor module detects weight – first determining if it is occupied, and if so by a child or adult – to control airbag deployment. As part of the system, the dashboard features an "Airbag" indicator light. BANGKOK, July 30,2008 - Local production of automobiles, excluding motorcycles, soared 20% year-on-year to 719,487 units in the first six months, driven by continued increases in exports and domestic sales, according to Surapong Phaisitpattanapong, spokesman for the Federation of Thai Industries' automobile industry club. The growth of Thai-built vehicle exports remained high, especially cars and pickup trucks, which resulted in an all-time increase in vehicle production. Vehicle exports from January to June surged 25.6% year-on-year to 385,870 units. Mr Surapong said local sales had climbed steadily since January thanks to the windfall 5% excise-tax reduction for cars running on the E20 fuel, six baht per litre cheaper than the premium petrol. As a result, car sales increased significantly by 32.4% year-on-year to 110,419 units in the first six months, making up 34.35% of industry-wide sales, against 28.5% in 2007. As well, sales of pickup trucks rose year-on-year in the first three months. The higher diesel price, however, has brought them down since May, especially in June when the sales fell 23.2% from the same month last year. But combined pickup truck sales in the first six months decreased only slightly, by 0.7%, to 181,888 units, representing 56.5% of nationwide automobile sales, compared with 62.64% in 2007. Of total vehicle production, car output rose significantly, by 40.2% to 203,148 units in the first six half, while commercial vehicle production rose 13.6% to 516,152 units. Production of pickup trucks, included with commercial vehicles, climbed 13.6% to 506,189 units. According to Mr Surapong, exports of fully built vehicles reached 385,870 units worth 174.79 billion baht, up 29.2% from the same period last year. Engine exports rose 94% to 8.92 billion baht while those of assembly kits leapt 38.3% to 67.36 billion and those of spare parts gained 32.2% to 4.50 billion baht. Mr Surapong said motorcycle sales, which shrank two years ago, started improving this year due to rising incomes in the farm sector on the back of higher food prices and the government's cash injection into the rural areas. Motorcycle sales inched up by 3.7% year-on-year to 879,418 units in the first six months. However, exports of motorcycle assembly kits dropped 13.1% year-on-year to 713,952 units in the first six months because more countries that used to import kits from Thailand became manufacturing countries. Sales of fully built motorcycles increased slightly to 75,236 units. Over the course of the first half of 2008, the majority of Japanese automakers increased worldwide production to some extent. However, rising pressures in some of its markets have forced Toyota to cut its production and sales targets for the full year. The downgrades to the forecasts are not wholly unexpected as rumours had circulated for weeks that Toyota was preparing to make such a revision. 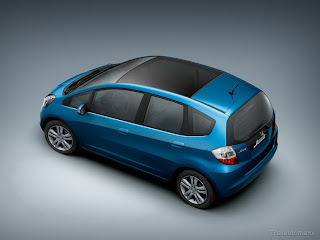 It remains to be seen now whether Toyota’s domestic rivals will follow suit given the similar challenges they all face. Japanese automakers have released their production and export results for June and the first half of the year, showing that many are still posting growth despite sales contractions in many markets. For the month, Toyota remained by far the largest of the companies, but it witnessed a decline in its exports from Japan of 8.5% year-on-year (y/y) to 221,534 units. The main cause of this is likely to have been the decline in domestic production during the month of 0.9% y/y to 365,135 units, while the company also suffered minor disruption as a result of an earthquake that hit Japan during the month. However, it did offset this decline with continued growth in production overseas, which resulted in a 1% increase in total global output for the month. Honda, the second-largest global producer of vehicles in Japan, suffered far larger declines during the month. It registered a 5.4% y/y decline in total global output to 322,866 units, as a fall in exports hurt its domestic production, while overseas output slid by 3.7% y/y, primarily as a result of flooding in China that hit its engine plant and caused a halt to operations at its two joint ventures (JVs) in the country. By contrast, third-placed Nissan enjoyed a strong month, as surging exports from Japan drove up production by one-third, accompanied by a small gain in overseas production, lifting its overall global production by 12.3% y/y to 309,688 units. Increased exports from Japan and rising sales in India helped Suzuki achieve a global production gain of 7.5% y/y to 223,573 units, while surging exports of certain models pushed up Mazda's global production by 11.3% y/y despite a downturn in overseas production. The closure of its Australian plant continues to hit Mitsubishi's global production hard, and this was a large reason behind its 7.4% y/y fall in global output during June. Despite a turbulent June for some, nearly all the Japanese automakers reported an increase in global production during the first half of the year, with Toyota leading the way with a gain of 5.8% y/y to 4.46 million units, driven by an increase in overseas production of 9.3% y/y. Although Honda saw a downturn in exports and domestic production during the six-month period, a gain of 8.5% y/y in overseas production saw it achieve growth in overall global output, albeit of just 1.6% y/y. Gains at Nissan's overseas plants were small, not helped by a slowdown in demand for sport utility vehicles (SUVs) and pick-ups in North America, but a surge in Japanese output driven by a 55.4% y/y increase in exports helped the carmaker achieve an overall increase in global output of 11.3% y/y in the first-half period. Gains overseas for Suzuki bolstered production in Japan to result in a 7.5% y/y increase in global output, while Mazda's global production grew by 13.5% y/y, driven by exports from Japan. Mitsubishi’s results were again hit by the closure of its Adelaide (Australia) facility at the end of March. Although there were significant gains in global production for Japanese automakers during the first half, the Toyota Group has announced that it has lowered its sales and production targets for the year. Total production for the year is now expected to be 9.5 million units for all its brands, down from an originally anticipated 9.95 million units, flat compared with last year. Both domestic and overseas production are expected be affected, and Toyota will be the worst-hit brand, forecasting a fall in domestic output of 200,000 units to 4.1 million, and a further 250,000-unit decline to 4.33 million units at its overseas facilities. Only Daihatsu production in Japan is expected to see any gains this year. In addition, the Toyota Group has downgraded its expectations for global sales this year from 9.85 million units to 9.5 million units, although this would still be an increase of 1% y/y. The Toyota brand’s sales forecast has been reduced by 340,000 units, including a 50,000-unit decrease to 1.55 million units in Japan, and although overseas sales are still expected to rise by 2% y/y, the forecast has been cut by 290,000 units to 6.95 million units. DEARBORN, Mich., July 30, 2008 -- Honeywell Turbo Technologies, a technology leader in engine boosting and modern turbo technologies, estimates that the global turbocharger segment will grow from 30 percent of the overall automotive market to more than 38 percent by 2013 as automakers look to boost engines to help increase fuel efficiency and reduce emissions without hampering the fun-to-drive factor. Ford is at the forefront of this spiking trend with its EcoBoost engine strategy, applying modern turbocharging and direct injection technologies to smaller displacement engines that offer improved fuel economy and fewer emissions, yet deliver performance feel of larger displacement engines. 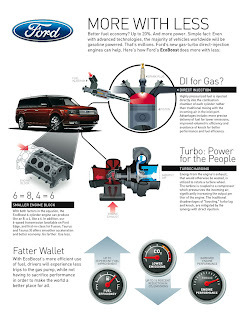 What separates Ford from the automotive pack using turbo technology today: Ford will apply the technology in significantly higher volumes, featuring turbocharged EcoBoost I-4 and V-6 applications in half a million vehicles annually within the next five years -- across multiple product lines globally. 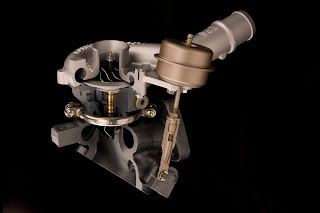 Turbos are the secret behind the downsizing, allowing for smaller displacement without performance loss. Unlike a supercharger, today's turbocharger uses the waste energy from the exhaust gas to drive the turbine -- energy that would have otherwise been lost. The result is increased torque and better performance, without increasing engine displacement. EcoBoost engines will be powered by turbochargers that leverage the latest advances in turbine design and materials. These aren't the turbos of the 1980s that delivered great amounts of torque yet frequently were plagued by short time gaps between stepping on the pedal and feeling the power -- turbo lag. They are smaller, spin faster, offer variable flow solutions and are fully interconnected with the engine management system for peak performance. EcoBoost debuts on the Lincoln MKS with a twin-turbocharged 3.5-liter V-6. This engine will deliver upwards of 340-plus lb.-ft. of torque across a wide engine range - 2,000 to 5,000 rpm - versus 270 to 310 lb.-ft. of torque for a conventional naturally aspirated 4.6-liter V-8 over the same speed range. MUNICH - July 30, 2008: The high-performance BMW M GmbH sports cars enter the year 2009 both ideally equipped and in top shape. With specific body modifications to the BMW M3 Saloon, the introduction of the new iDrive generation for all versions of the BMW M3, the BMW M5 and the BMW M6 as well as a "competition package" for the BMW M6 Coupe, we have ensured that the respective models are able to continue to strengthen their pole position in the disciplines design, ease of operation and driving pleasure. The BMW M GmbH currently offers nine models, this being the most varied and attractive product portfolio in its 30-year history as a supplier of exceptionally sporty production cars. More than 300,000 BMW M automobiles have been handed over to customers since 1978. 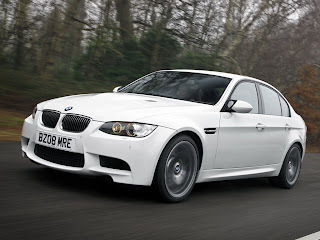 The most successful model was and still is the BMW M3, now being offered in three different body versions. After the launch of the BMW M3 Coupe, the BMW M3 Saloon and the BMW M3 Convertible were also successfully brought to market this year. All versions of the BMW M3 are powered by a 4-litre,V8 engine delivering 309 kW/420 bhp at 8 300 rpm. The power unit was especially developed for this model and possesses high-revving characteristics with unequalled acceleration. As an alternative to the standard six-speed manual gearbox, all versions of the BMW M3 are optionally available with the M Double Clutch Transmission with Drivelogic. It has seven gears and shifts without interruption of traction, thereby facilitating even more dynamic acceleration. The M DKG Drivelogic also has a positive effect on the BMW M3's efficiency. Furthermore, it provides gear shifting comfort on par with the supreme standards of a BMW automatic transmission. BMW M3 Saloon : New rear light design. In the model year 2009 and analogous to the BMW 3 Series Saloon, the four-door BMW M3 will also feature divided rear lights with the brand-typical L-shaped contour. The two LED light clusters for the taillights and the indicator lights, which also feature LED technology, have a distinctive and high-quality appearance. The new rear end design is rounded off by modifications to the bumper and rear lid. The list of interior refinements includes a newly conceived fresh air grille located in the centre of the cockpit, a newly designed storage area under the armrest on the centre console and a pearlescent chrome light switch cluster. The new start/stop button, also in pearlescent chrome, and the rotary controls for the air conditioning sporting the same design are not only featured in the BMW M3, but also in the Coupe and the Convertible. Likewise, from the autumn, all variants of the BMW M3 will be equipped with crash-active headrests that reduce the risk of cervical injury in the event of a rear end collision. The choice of exterior colours available for the BMW M3 will also be widened as from the autumn. The colour space grey metallic is now also available for the BMW M3 Saloon. Le Mans blue metallic is new in the range of colours offered for all body variants. Competition package for the BMW M6 Coupe. In the model year 2009, the BMW M6 Coupe in particular presents itself as a top athlete on the road to new all-time highs. With the new competition package, the two-door coupe has managed to strengthen its consistently high performance-oriented profile even further. The competition package comprises a newly tuned suspension, including lowering by 12 millimetres at the front and 10 millimetres at the rear, adapted suspension control systems and forged alloy wheels in double spoke design. The modifications are prominently noticeable through improved handling and the competition package also contains distinctive visual differentiations. A re-contoured bonnet featuring two raised precision lines also emphasises the enhanced dynamic characteristics. BMW M5 and BMW M6 : New exterior mirrors with widened field of view and increased efficiency. With new equipment features and optimisation in safety and efficiency, product quality offered by the models BMW M5 and BMW M5 Touring, the BMW M6 Coupe and the BMW M6 Convertible has increased even further in the model year 2009. In future, the high-performance sports cars powered by the 373 kW/507 bhp V10 engine will also feature brake energy regeneration and an air conditioning compressor which can be uncoupled - both features having been developed within the framework of BMW EfficientDynamics. Moreover, the new smooth-running bearing for the rear axle transmission is characterised by an optimised friction coefficient and its efficiency-enhancing construction. The new exterior mirrors with widened field of view are an additional safety highlight on all four models. Carbon black metallic has been added to the range of available colours. More supremacy through intuitive operation: The new iDrive generation enhances driving pleasure. From the autumn of 2008, BMW M models will also feature the new generation of the iDrive control system which will facilitate even easier activation and control of the most important entertainment, communication and navigation features as well as a number of other functions. The models BMW M5 and BMW M5 Touring, the BMW M6 Coupe and the BMW M6 Convertible are all equipped with the new iDrive control system as standard. It also comes with the BMW M3 in conjunction with an optionally available navigation system. It encompasses a newly devised controller which includes preference keys on the centre console and - in conjunction with the optional navigation system Professional - an 8.8-inch control display with a four times higher screen resolution (1280 x 480 pixel) for displaying high resolution graphics and a new menu structure. Flat menu trees and familiar systematic with cascaded main menus derived from computer technology provide improved orientation. Visual control aids which include, for example, an image of the controller displayed on the monitor, provide additional clarity. Town or street names are spelled and telephone numbers entered by means of a circular "speller". The functional range of the tried and tested preference keys situated below the radio control unit have been further optimised. Using these, it is now also possible to store not only radio stations, telephone numbers and destinations, but also all further menu items accessible via iDrive, which can then be retrieved at the push of a button. In the BMW M3, the new controller and the preference keys arranged in its vicinity are surrounded by a newly designed cover for the centre console. The central control element facilitates the operation of various functions by means of standardised rotary and toggle switches as well as push-buttons, whereby the additional keys can be operated without eye contact due to their individual haptic attributes, offering direct access to the most important menu options. The new iDrive controller is, therefore, now much simpler to use and can be operated intuitively without a long familiarisation period. Consequently, the driver gains additional confidence and can concentrate even more intensively on the job of driving. The perfect travel companion: Navigation system Professional with full screen display, preview maps, 3D symbols and guided tours. The new navigation system Professional for the models BMW M3, BMW M5 and BMW M6 offers full screen map display. Travel maps, details of the surrounding area and symbols for places of interest can be displayed as three-dimensional graphics. When defining a desired destination from a list of locations, a map preview of each proposed destination appears additionally on the display when the selection function is activated. Thanks to this geographical information, different destinations bearing the same name can easily be distinguished from each other. The travel planner with guided tours function integrates various destinations into an individual route and, if desired, the driver can also add his own choice of stopovers to the routeing. The storing of navigation data on an on-board 80 GB hard drive guarantees shorter access times. Moreover, this data storage medium can be used as a music archive. For this purpose, music files from a CD, an external MP3 player or a USB stick can be transferred to the hard disc, after which the music files are permanently accessible. INGOLSTADT - MUNICH - July 29, 2008: While many things may be new with FC Bayern München, when it comes to its “company cars” the German record champion again relies on equally sporty and comfortable support in the new season: Rupert Stadler, Chairman of the Management Board of AUDI AG, today handed over the keys to the new “company cars” to the players, coaches and management staff in Ingolstadt and wished the team a successful start to the season. AUDI AG and FC Bayern München have been “on the ball” together since the beginning of the 2002 season. As always, the players of the double winner had a free choice from the model range – and, as always, the clear majority of the pros opted for the sportiest versions of the Audi models: without exception, they selected cars with quattro drive. The front runner was the new Audi S5 – as many as five players, including Philipp Lahm and Christian Lell, chose the 354-hp coupé. The new coach duo sports the same style along the boundary as well as on the road: from now on, Jürgen Klinsmann and co-coach Martin Vasquez will be driving to practice sessions in a new Audi Q7 powered by a 4.2-litre diesel engine. The former German national coach’s colour choice was cobalt blue metallic, while his assistant ordered the popular SUV, which Daniel van Buyten and Martin Demichelis selected as well, in calla white. “We are pleased to be standing side by side with the most successful German club again in the new season. The team exudes a notable, positive spirit that promises to deliver excitement galore during the upcoming season. We look forward to thrilling matches and wish FC Bayern a season full of victories and successes,” said Rupert Stadler, Chairman of the Management Board of AUDI AG, on the occasion of handing over the vehicles at the Audi Piazza in Ingolstadt. Immediately afterwards, the team headed for Tokyo to a friendship match with its Japanese partner club, Urawa Red Diamonds. Not only the boss himself but many of his employees keep their fingers crossed for FC Bayern each weekend: at the beginning of 2003 the workforce founded the Audi FC Bayern fan club, which now has a membership of over 5,000. “We keep noting how much enthusiasm for football there is at Audi. This makes the partnership between Audi and FC Bayern, which has been in effect for six years now, a perfect combination,” said Chairman of the Board Karl-Heinz Rummenigge. The partnership between the two premium brands, which far exceeds a typical sponsoring commitment, continually manifests itself in new ways. An example is the Audi shop in the “Brand World” of the “Allianz Arena”, which is a permanent and popular meeting place. On more than 200 square metres featuring a modern shop design supporters can find vehicles from Audi’s current sporty model range as well as the FC Bayern collection of quattro GmbH. In addition, Audi presents itself with the four rings at the club’s home venue, the “Allianz Arena”, as well as at numerous other activities and events. When you’re running a small business, unexpected bills can make a serious dent in your profits. And when your van is essential to your work, the last thing you need is an unexpected service bill eating into your income. Luckily, anyone who buys a new Vauxhall Commercial Vehicle between now and October 2 can benefit from five years’ or 100,000-miles worth of free servicing, meaning no nasty shocks lurking round the corner. What’s more, the free servicing offer is running in conjunction with a zero per cent finance offer over three years, subject to a 20 per cent deposit, thus helping to keep business running costs even lower. The offer is available on all models in the Vauxhall Commercial Vehicles range, from the award-winning Corsavan, via the British-built Astravan and Vivaro models, right up to the seriously big Movano. The offers also both apply to Vauxhall’s comprehensive core conversion line-up, meaning whatever you do for a living, chances are the company has a vehicle to suit. 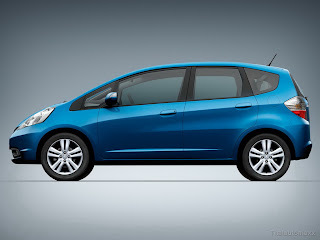 DETROIT – From nicely equipped entry subcompacts to award-winning midsize sedans and a capable, compact SUV, General Motors offers plenty of choices for consumers who want to wring more miles out of a gallon of gas. 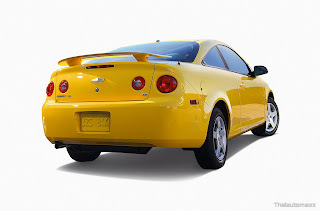 Seventeen 2008 GM models – more than any other automaker – achieve EPA fuel economy of 30 miles per gallon or higher. Chevrolet leads the pack with eight models – including the hot-selling Chevrolet Malibu midsize sedan, the 2008 North American Car of the Year – followed by Saturn with five and Pontiac with four. Topping the mpg performers are the recently released Chevrolet Cobalt XFE (Extended Fuel Economy) and Pontiac G5 XFE sedans, equipped with a 2.2L four-cylinder engine and a five-speed manual transmission that deliver 36 mpg and 35 mpg, respectively, on the highway. In fact, Cobalt XFE’s highway fuel economy beats a comparably equipped 2009 Toyota Corolla. “GM has been and continues to be a leader in delivering a broad range of fuel-efficient vehicles to customers,” said Mark LaNeve, GM North America vice president, Vehicle Sales, Service and Marketing. “In addition to the 17 models for 2008 that achieve 30 mpg or better on the highway, many of our vehicles either win or are strong contenders in their segments. 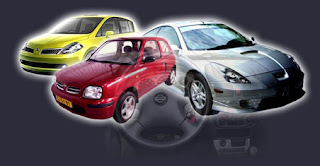 Chevrolet: Aveo sedan, Aveo5 (both 32 with automatic transmission, 34 with manual); Cobalt coupe and sedan (30 to 33, depending on engine and transmission selection); Cobalt XFE coupe (36); Malibu 2.4L (30 with four-speed transmission; 32 with six-speed); Malibu Hybrid (32), HHR (30 with 2.2L and automatic or manual transmission) and HHR Panel (30 with 2.2L and automatic or manual transmission). The Chevrolet Malibu, Malibu Hybrid and Cobalt XFE coupe are new models for 2008. The Cobalt XFE uses revised engine calibration, low rolling-resistance tires, a new, 3.74:1 final drive ratio and other technologies to drive a 9-percent highway fuel economy improvement and outdistance comparably equipped competitors such as the Honda Civic, Ford Focus and 2009 Toyota Corolla. Pontiac : G5 (31 to 33, depending on engine and transmission selection); G5 XFE coupe (35); G6 2.4L sedan (30); Vibe (31 with automatic transmission, 33 with manual transmission). The G5 XFE is new for 2008; it achieves an EPA estimated 35 mpg highway using the same powertrain and tire efficiencies as the Cobalt XFE. Saturn: Astra 5-Door XE and XR; Astra 3-Door XR (all 30 with automatic transmission, 32 with manual); Aura XE four-cylinder (30); Aura Green Line Hybrid (32); Vue Green Line Hybrid (32). Both Astra and Vue are all-new for 2008. Edmunds.com recently named Astra its top-rated coupe under $25,000. BANGKOK, July 29 - Car sales in both the export and domestic markets have grown in almost all categories except for pick-up trucks during the first six months of this year. Surapong Paisithpatanapong, spokesman for the automotive group of the Federation of Thai Industries (FTI) said the domestic market for passenger cars has expanded in response to the 5 per cent cut in excise duty to encourage energy-efficient vehicles. Sales of passenger cars using the alternative E20 fuel, cheaper by six baht/litre compared to premium gasoline have accounted for over 34 per cent of all vehicles sold during the first half of this year – with over 110,000 units sold during the period. The skyrocketing prices of diesel fuel resulted in a plunge in sales figures for the oil-guzzling one-tonne pickup trucks, with sold only 181,888 units during the first half of 2008. 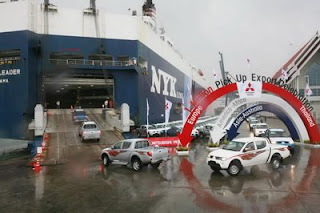 However, this is offset by robust export performances in other categories as Thailand exported over 385,000 passenger cars and pick-up trucks in the first half of 2008 –a 26 per cent increase compared to the same period last year. Motorcycles, sales of which have declined during the last two years, have showed signs of sales recovery. Expensive farm commodities, together with pump-priming at the grassroots, resulted in nearly 880,000 units sold during the first half of this year, a four per cent increase year on year, according to FTI figures. 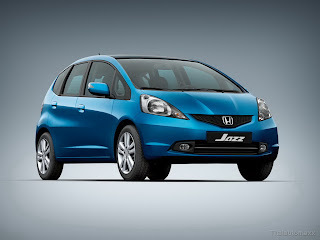 TOKYO - July 29, 2008: Honda's all-new Jazz is once again set to redefine the B-segment parameters of practicality and interior space. The 5-door hatchback will achieve class leading interior space and combined it with significantly improved fuel economy and 120 g/km CO2 emissions (1.4-litre i-SHIFT and 1.2-litre). The exterior design is at first glance an evolution rather than a revolution, but this subtle change of appearance is only one small part of the thousands of changes that push the all-new Jazz forward. It retains the concepts of the previous Jazz with its centre fuel tank layout and Magic Seats which gave it world beating interior flexibility. 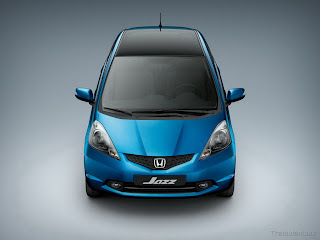 Yet while the best features are retained, including cabin space to rival mid-sized saloons, the new Jazz brings change to every area, raising the bar even further and promising to expand on its success in the supermini segment. The previous generation was given more than fifty awards and has sold over two million around the world since its 2001 launch. A slightly larger, 'cab forward' style body brings better visibility and means Jazz is even more spacious, benefiting rear legroom and boot space in particular. The Magic Seats now dive down in one easy action and their versatility is now complemented by a new Double-Trunk boot feature in the luggage bay. New, more powerful petrol engines, capable of outstanding economy, are designed to appeal to customers who might be downsizing as well as those looking to achieve fuel economy comparable to diesel powered models. Their balance between economy and lively performance are unmatched in the class. 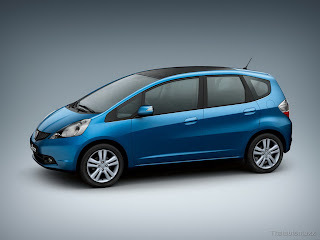 Adopting Honda's VTEC technology (Variable Valve Timing and Lift Electronic Control), the new 1.2 and 1.4-litre four-cylinder engines are connected to either a 5-speed manual transmission or, on 1.4 models, Honda's i-SHIFT 6-speed automated manual transmission which includes steering wheel-mounted paddle shifters. Offering 90 PS compared to the 78 PS of its predecessor at a slightly higher 6,000 rpm and torque up from 110 to 114 Nm for improved performance, the 1.2-litre engine nevertheless achieves 5.1 l/100km combined, down from 5.5 l/100km, while CO2 emissions are also improved, reduced from 129 to 120 g/km. It is a similar story with the new 100 PS, 127 Nm 1.4-litre engine. Compared to the previous i-DSI unit which produced 83 PS and 119 Nm, fuel economy is now 5.3 l/100km for the manual model (down from 5.8 l/100km) and an even better 5.1 l/100km when equipped with the i-SHIFT semi-automated manual transmission (5.9 l/100km for the previous 1.4-litre CVT). CO2 output drops to 124 and 120 g/km, respectively (down from 137 and 139 g/km). The new SIL (Shift Indicator Light) fitted to manual models, similar to that found on the new Accord, provides a visual prompt of the best gear shift points to maximise economy. The 1.2 and 1.4-litre models are equipped with an evolution of the previous 5-speed manual transmission with gear ratios optimised for a more sporty driving experience while ensuring good fuel economy. Manual transmission-equipped models feature the new SIL (Shift Indicator Light) within the centre of the rev counter, also found on the latest Honda Accord. Providing the driver with a visual prompt of the best gear shift points to maximise economy, it has been demonstrated to provide meaningful fuel economy improvements. As well as a 5-speed manual gearbox, the 1.4-litre engine can be teamed up with Honda's latest i-SHIFT transmission. The first time a 6-speed automated manual transmission has been offered in this vehicle class, the gearbox offers better fuel economy than is possible with either a true automatic or a CVT (continuously variable transmission). The unit is a development of the system first fitted to the Civic, with improvements made including; reduced gear change times, smoother shifts and more intelligent automatic mode shift logic. Despite those increased dimensions, the turning circle at 9.8 m kerb to kerb is no larger than that of the previous Jazz and together with improved visibility, the new car's around town abilities are even better. Even more efficient safety performance results from the introduction of the ACE (Advanced Compatibility Engineering) body structure, a concept that is being progressively rolled out across the Honda range. Its structure, in particular a front polygonal main frame, helps to reduce the negative effect of misalignment between vehicles of different sizes and construction and multiple energy absorbing pathways disperse impact energy to prevent cabin deformation. Standard on all models are dual front and side airbags, full length side curtain airbags and three-point seatbelts in all five seating positions, those in the front with dual-stage pretensioners. The front passenger airbag can also be deactivated to allow a rear facing child seat to be fitted to the front seat and for the first time Jazz is equipped with seatbelt reminders for both the front and rear seats. Front seats are also fitted with active headrests to minimise the potential for whiplash injuries. The ingenious interior layout of the original Jazz, with its compact suspension and centrally-mounted fuel tank liberating more load space, together with the increased external dimensions of the new model, mean interior comfort has been taken to a new level. Rear seat passengers now have 37 mm greater knee room, while the distance between front and rear passengers is up by 30 mm. The slightly wider body also means shoulder room increases by 44 mm in the front and 43 mm in the rear. 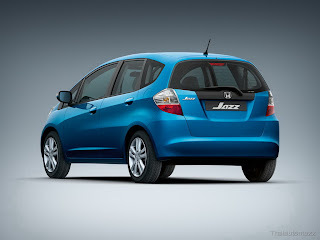 Given the popularity of the previous Jazz's innovative 'cinema' style rear seats, it comes as little surprise that Honda chose to offer a similar arrangement in the new car; but while the latest Magic Seats operate on the same principle, they are even more convenient since they have a one-motion, dive-down operation. No longer is there a need to move the front seats forward to collapse the rear seats. Instead, thanks to headrests that are virtually flush with the seatback, the 2:1 split rear seats are able to clear the front seats even when the latter are slid back to their rearmost position. 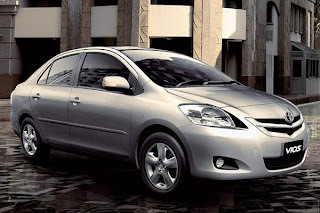 High quality, pleasant-to-the touch materials, stylish design and tasteful colours give the cabin a more upmarket feel. TURIN -- July 29, 2008: A glorious past, a victorious brand name and a rich heritage in motorsport all combine as Fiat Group Automobiles re-launches the Abarth brand in the UK this July. The second option -- known as the esseesse (SS) kit -- primarily increases the power of the engine, and is only available in conjunction with the Assetto kit. It adds several components including a special air filter, a larger Garrett turbocharger, new injectors, larger diameter freeflow exhaust system, and a revised engine control unit with esseesse software. All of this boosts engine performance from 155 bhp to 180 bhp. Visually, the £3,500 esseesse kit includes unique logos for the tailgate, wing mirror covers and engine cover. Inside, the Abarth touch is equally apparent. The charismatic Abarth scorpion badge is positioned on the passenger side of the dashboard, for example, while the 'carbon effect' central console is decorated with a textured cube motif. The car's instrument panel has been given a sporty new design, and the same smart finish is used for both the steering wheel and gear stick -- black leather with red stitching. The launch of the Grande Punto Abarth is a tribute to an 'army' of small Fiats from the 1950s and 1960s, that were given a tough, dynamic and sporty edge by the 'magic hands' at Abarth. They were 'scorpions' with a real sting in the tail, igniting the passion of thousands of drivers with a taste for challenge, speed, and Italian flair. Today, the Grande Punto Abarth is the first of a series of road and competition cars aiming to bring back those former glory days of excitement, success and high performance. The Grande Punto Abarth is fitted with a 1.4 turbo (T-Jet) petrol engine, delivering 155 bhp. Combining with a 6-speed manual gearbox, the engine gives the car a top speed of 129 mph, and a 0-62 mph acceleration time of just 8.2 seconds. The Grande Punto Abarth is not just a high performing small car -- it is also safe, and respectful of the environment. Safe because the tuning is not limited to the engine and the aerodynamics: the car's brakes and chassis set-up have also been upgraded and professionally engineered to cope with the improved performance. Via a 'drive-by-wire' throttle system, the 1.4 litre T-Jet engine provides outstanding low-end torque, almost entirely devoid of the lag in power delivery traditionally associated with turbocharger installations. The Assettoand esseesse kits, which are delivered to customers packed in original wooden crates -- in keeping with Abarth tradition -- may only be sold and installed by the official network of Abarth Assetto Corse tuners on a Grande Punto Abarth 1.4 Turbo T-Jet 155 bhp. This conversion must take place within one year or 20,000 km (12,000 miles) from its first registration. Conversions are covered by a two-year Abarth warranty from the installation date. The second car to receive Abarth's exceptional engineering work is the iconic 500, which set the motoring world alight following its launch in July 2007. Faithful to the 'small but wicked' phrase coined for Abarth cars in the 1950s, the new 500 Abarth, which is making its mainland Europe debut this summer, is a small car with stunning performance. Powered by a similar 1.4-litre 16-valve Turbo petrol engine, it delivers a maximum 135 bhp at 5500 rpm and peak torque of 206 Nm (152 lb ft) at 3000 rpm in 'Sport' mode. In 'Normal' mode the maximum torque becomes 180 Nm (132 lb ft) at 2500 rpm. The front of the car also clearly demonstrates the 500 Abarth's sporting credentials. There's a triple air intake -- the central one being larger than on the series model -- and a much broader opening above the number plate. Additionally, two symmetrical 'nostrils' on each side of the bumper correspond exactly to the position of the two identical intercoolers, which can be seen through these apertures, guaranteeing optimum intake and airflow. Inside, the 500 Abarth has a decidedly sporting feel, with special instrumentation and an analogue turbo pressure gauge. The main instrument panel has sporty graphics and includes a boost gauge/gearshift indicator, while the three-spoke steering wheel features special thumb-grips and is 'flat' at the base to make it easier to adjust. The distinctly 'racing' feel is also in evidence in the pedals, which are aluminium with rubber inserts, in the gear lever knob (upholstered in leather with a sporty, more ergonomic grip) and in the 'unified' seats with head restraints built into the seat backs. Lastly, the roof lining and side trims are black, giving the cabin an appropriately sporty look. Located in the former Mirafiori engineering plant -- known as Officine 83 -- the Abarth building is perfectly placed to interact directly with the Fiat Group's Style Centre (Centro Stile), experimental construction centre and the Engineering and Design departments. The building's entrance hall houses the company's characteristic 'Wall of Fame' showing famous Abarth victories, while next to the entrance is a 560m2 showroom displaying models and artefacts from Abarth's rich history.